A very good friend of mine loves French food and wine and likes to end a dinner with a good desert wine. So, I set out to trick him on one occasion when he was having dinner with us by telling him that I was going to serve a rather special desert wine. I duly charged his glass with the wine concerned, which was red in colour. But, Ian, he said, are you sure this is a desert wine because of its colour; have you not made a mistake? No, I told him, not all the best desert wines are white. He tasted it and liked it immediately, but could not identify it. It was, in fact, a wine from Maury, a village in the Pyrénées Orientales in the Languedoc-Roussillon region located in the upper Agly valley, inland from Perpignan. 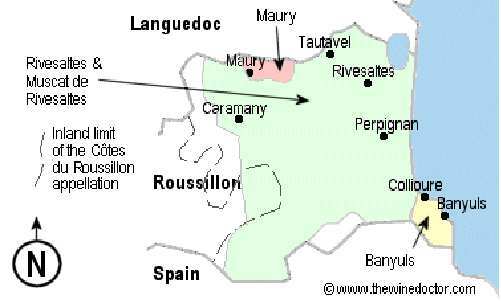 Maury is one of the communes of the Côtes du Roussillon, but differs from much of the Roussillon wine area by the presence of schist, which is also found innearby Rasiguères, Saint-Paul-de-Fenouillet and Tautavel. These four communes qualify for the Maury appellation d’origine contrôlée (AOC), a guarantee of geographical origin, distinguishing these fortified wines from those of the Rivesaltes wine denomination. Incidentally, Rivesaltes is the birthplace of the vin doux naturel, a creation of Arnaud de Villeneuve, the eminent 13th Century physician. He discovered the process of halting the alcoholic fermentation by adding spirit to the must, thus giving rise to a new kind of wine. With the advent of the development of the appellation system in the 1930s, the first regulations were laid down in 1936 governing the production of sweet fortified wines from Rivesaltes, Côtes d’Agly and Côtes de Haut-Roussillon. Under the regulations, the red Maury wine – there is also a white Maury – must comprise at least 75% Grenache Noir, the other principal grapes are Grenache Gris, Grenache Blanc and Maccabeu, the latter not exceeding 10%. In addition, the grape varieties of Carignan and Syrah, up to a maximum 10%, are also permitted. Both colours see twelve months in wood before bottling. Maury red is the nearest French equivalent of a port wine, with a distinctive deep mahogany colour, but is not as strong as port. Maury has a lower alcohol by volume of 15.5%/16% and, apart from deserts, goes extremely well with cheese at the end of the meal, if you prefer the English way to the French way of having the cheese before the desert. If, however, you prefer the French way, Maury goes well with after dinner plain chocolate. The 2007 Maury vintage is now drinking well, having won a silver medal at the Paris wine competition in 2009. This Maury is from the Agly wine cooperative. Another Maury to look out for is that from the Mas Amiel, which is reputed to be the best. If, however, you really wish to push the boat out and can afford to do so, you might go for the 1928 vintage Maury, which commands a price of £720 per case. My friend would certainly agree with that assessment! And so would I! A desert wine with a difference and well worth trying! One of the delights of living in France is going out to eat. In our region, there is such a wide choice of eating places to suit every taste and every pocket from the humble Estaminet to the Michelin Starred Restaurant, of which there are many. Someone one said – and I would heartily agree! – that there are three decisions to be made each day: where to eat; what to eat; and what to drink! Choosing a wine in a restaurant need not be such an intimidating task. Of course, one can always rely on the recommendations of the sommelier, who, if he or she – and there are some well-trained, knowledgeable and experienced female sommeliers around – is worth their salt, they will not, generally speaking, rip you off! After all, they – and their bosses – will want you to enjoy their choice and for you to come back. However, don’t be intimidated by them. Some can be quite pushy and condescending. Also, they are usually in a hurry rushing from table to table. In such cases, get their attention and keep it until your questions have been answered satisfactorily! 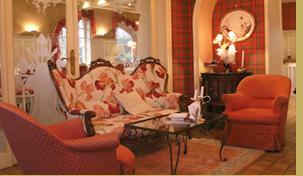 The first tip is to take your time looking at the wine list (la carte des vins). Depending on the establishment, this will be well laid out and informative. In some places, it is voluminous and known as ‘la Bible’! 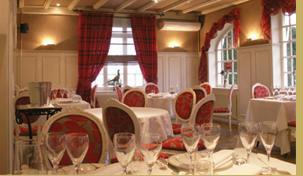 If you like wine from a particular region, say, Burgundy, then look at what is on offer. If, by chance, there is no vintage indicated, ask the sommelier to bring you a bottle and check the year for yourself. Remember, generally speaking, with reds the older the better; and with whites the younger the better. Never be rushed into making the final selection. Again, if you are not sure of a particular wine that takes your fancy on the wine list, ask the sommelier to tell you about its particular characteristics, especially whether it will go well with what you have chosen to eat. 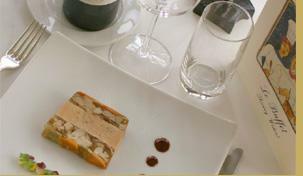 Matching the wine and the food is so important, if the culinary experience is going to be satisfying and memorable! Don’t go, necessarily, for the cheapest bottle in the category selected. For example, in the Burgundy category a ‘Passe-Tout-Grains’ may well be the cheapest, but is usually pretty horrible compared, for example, with a ‘Gevrey-Chambertin’! Also, ask about the year in order to compare prices. Why is one bottle more expensive than its counterpart? There will be a reason for this and you will need to find out what it is to make an informed choice! Incidentally, when the French dine out, they generally tend to choose the best wines irrespective of the price. They are out to enjoy themselves! Perhaps we should follow their example and leave ‘Scrooge’ behind! In some restaurants, they feature the ‘wines of the month’, which are usually offered at a reasonable price. Again, find out about them before choosing one of them. But also, don’t be guided solely by price. As far as an aperitif is concerned, a glass (coupe) of the house Champagne is often a good bet! And talking of ‘house wines’, again depending on the standard of the establishment, these often represent good value for money and should not, necessarily, be shunned! Once again, ask about them and don’t be embarrassed in doing so and choosing one. As for dessert wines, which can be expensive, be careful and ensure that they are available by the glass and, depending on the number of takers, compare the price of a glass with that of the bottle. One final word of warning: wines in French Restaurants – as, indeed, is the case elsewhere – are subject to high mark-ups. It is often said that the profit of the Restaurant is in the alcohol! Realise this and don’t let this hold you back or spoil your enjoyment of the wines you choose. In some French Restaurants, the practice is growing of bringing your own wines to drink with the meal. Known in the trade as ‘BYOB’ – bring your own bottle! There is always a small fee (corkage) for this privilege. Always find out in advance whether this is permitted and what the charge is. This reminds me of a story of the Theatre Royal Stratford in East London. At the beginning of the interval, an actor comes onto stage to announce that the bar is now open, whereupon there is a cheer from the audience. He then makes a further announcement, with a great flourish, that the drinks are free! This produces an even louder cheer from the audience! Following this, the actor then announces that a nominal charge, however, is made for the use of the glasses! Enjoy choosing your wines and quaffing them!